My husband is a fishing FANATIC. When I was originally trying to decide what to do for our son’s first birthday cake, I figured it was a no brainer that it would be fish-themed. I was going to try a layered cake done with fondant and fish shapes all around it. But that seemed like too much work, plus that fondant stuff just seems so yukky and unhealthy, and I wanted our son to be able to eat his cake! So I started looking for images of other fish cakes for ideas. 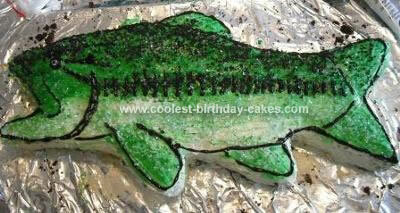 Well, of course once my husband got it in his head we were doing a fish cake, he wanted to be the one to decorate it! I couldn’t believe how excited he was to do it! So what we did is I made the cake from a healthier chocolate cake recipe I had that uses agave instead of sugar. It turned out amazing! We layered it with chocolate ganache (again using agave, no sugar), then my husband traced the outline of the cake using pictures from his fishing magazine. I made the buttercream frosting (agave, no sugar) and he did all the decorating, and voila! We were both so impressed! What we got is a relatively healthy chocolate ganache fish cake! Not completely sugar free though, I’m afraid the sprinkles are sugar. Oh, and this Bassmaster Birthday Cake is only the trial cake, the one for his birthday will be 4x the size and my husband wants to do a musky! I got all my recipes from a book called Baking with Agave which doesn’t use any refined sugar. This cake also uses zucchini, so much better and healthier than a box variety and I don’t feel guilty giving it to my child (and other people’s children!). And it tastes wonderful!